The OM 636 is a water-cooled, vertical diesel engine with a power rating of between 25 and 42 HP at maximum speed dependent on the fuel injection equipment fitted. The cast iron crankcase has integral cylinders with a standard bore of 75mm. Re-boring is possible up to a maximum bore of 77mm. Pistons are available in 4 repair sizes. It is also possible to reline the block back to standard bore. The injection pump and oil filter are located on the right hand side of the engine (as seen from the flywheel end). The generator, starter motor, oil dipstick and breather pipe are on the left. At the front, an alloy timing cover encloses helical gears driving the camshaft and injection pump off the crankshaft. A side cover seals the valve lifter chamber. The alloy oil sump is bolted to the crankcase. The cast iron cylinder head is fastened to the crankcase by hexagon-head bolts. A composite cylinder head gasket seals the combustion chambers and water passages between the head and the crankcase. The cylinder head features removable precombustion chambers into which injectors atomize the diesel fuel for combustion. Pre-heater plugs are used as a starting aid. An alloy rocker cover with an oil filler seals the top of the cylinder head. The 3-main bearing, drop-forged crankshaft has hardened bearing surfaces. The centre bearing serves as the thrust bearing. Counterweights on the crankshaft compensate for the rotational inertia in relieving the forces on the main bearings. The coolant pump is driven by a 'V' belt pulley fitted to the front of the crankshaft. The forged steel connecting rods are equipped with bronze bushes at the small end to accommodate the piston pin and a 2- piece friction bearing at the big end. The bearing cap is secured to the connecting rod by 2 special bolts and nuts. The alloy pistons generally feature 3 compression rings and 2 oil scraper rings. The floating piston pin is retained by circlips. The piston crown is dished. The drop-forged camshaft with hardened bearing surfaces and cams is supported by 3 alloy bearings in the crankcase. Axial movement is controlled by the front camshaft bearing which together with the 2nd camshaft bearing is of a split design. Each cylinder features an overhead exhaust and inlet valve opened and closed by the camshaft by means of mechanical lifters, pushrods and rocker arms. The fuel lift pump is mounted on the injection pump and draws fuel from the tank. It incorporates a hand primer pump that is used the bleed the fuel lines of air (e.g. after filter replacement). Diesel fuel is fed to the injection pump after passing through a filter. The low pressure of this fuel feed to the injection pump is regulated by a pressure relief valve fitted on the fuel filter head. The injection pump delivers fuel under high pressure to the injectors via rigid injector pipes of equal length. On engines fitted with BOSCH injectors excess fuel is returned to the fuel tank by a metallic spill pipe interconnecting the injectors. A flexible fuel spill hose is used on engines fitted with TDZ injectors. 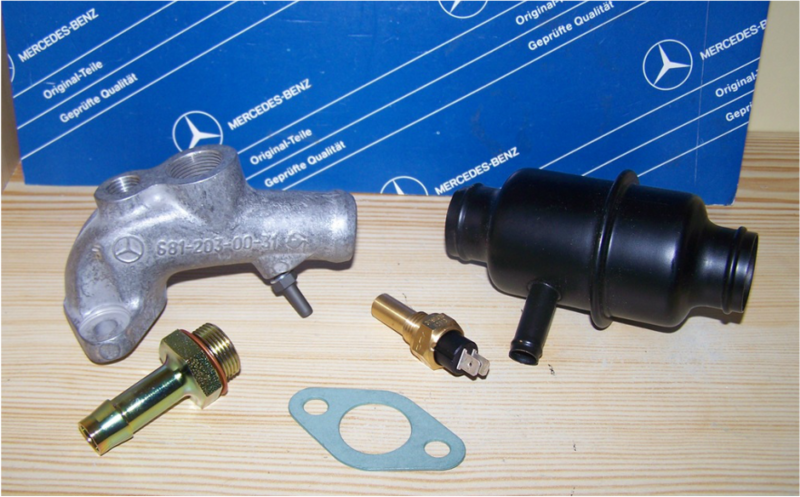 Depending on application, the injection pump is fitted with a pneumatic or centrifugal governor that controls the amount of fuel injected according to engine load. On engines producing the maximum 42HP an automatic timing device advances the timing of the pump with increasing engine speed. Engine lubrication is provided by an oil pump driven by the camshaft. Oil is drawn from the sump and directed into the main oil gallery after being filtered by a fine mesh strainer or cartridge-type filter. Oil is fed to the crankshaft and camshaft bearings via small bores. From the front camshaft bearing, oil continues to the rocker shaft pedestals and cylinder head through external oil lines. The rocker arm bearings and pushrods are lubricated by oil flowing through hollow rocker shafts. Cylinder bores, piston pins and timing gears are splash-lubricated. Two pressure relief valves are fitted to the oil circuit. The main circuit features a relief valve that opens at 8 bar, protecting the engine against excessive oil pressure. The oil filter is equipped with a valve that opens at 2 bar allowing oil to by-pass the filter should it be clogged. Most installations feature an electrical or mechanical gauge to monitor the engine's oil pressure. The injection pump and cooling water pumps have their own oil supply and are not connected to the main engine lube circuit. However, modern replacement water pumps feature sealed-for-life bearings and require no maintenance. Engine temperature is controlled by means of a belt-driven coolant pump, a radiator or heat exchanger and a thermostat.